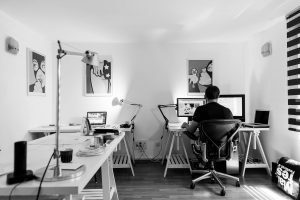 Your office should be a reflection of the rest of your home and of your professional self. Make it count with a custom build, and consider these tips as you do so. Maybe you use your home office to telecommute or to run a home-based business. Perhaps it’s simply where you pay bills and make important phone calls. For whatever the purpose, your home office should be more than a ramshackle desk and an extra chair. Does the room receive lots of traffic? How can you deal with distractions? Do you want the office to be tucked away in a corner? Would you rather have your office in a more public space? All of these factors, as well as how you want the room to be lit, are incredibly important decisions. They will all dictate where the office goes in your home. While the layout and style of your home office are important, you also need to have comfortable, and functional furniture to fill the room. Invest in ergonomic, comfortable, and attractive chairs and desks. These will be well worth the money in the long run. Your home office doesn’t need to be as bland as the bills you need to pay in it! Give yourself a view, and position your desk so you can look out the window. Sometimes simply hanging a beautiful picture can do the trick. Paint the walls an attractive, and uplifting color to help inspire you to get your work done. Also, choose comforting accessories to really maximize the space you have. Everything in your custom home office should be totally geared toward what you as a worker and creator prefer. It’s all about what helps you to work best. If you want your home office to feel like an extension of the rest of your home, pick a color scheme that fits the rest of the space. If you prefer a more somber tone, paint in dark colors, and utilize limited lighting. 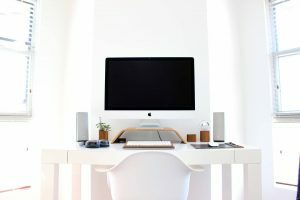 Obviously, you don’t want to clutter up your workspace with things that won’t help you be more productive. However, you should consider one addition to help increase your productivity and the appearance of your office. Houseplants can help increase your productivity by up to 15 %. Plants decrease your cortisol (the stress hormone) as well as your blood pressure. Also, they can even substantially drop your heart rate. 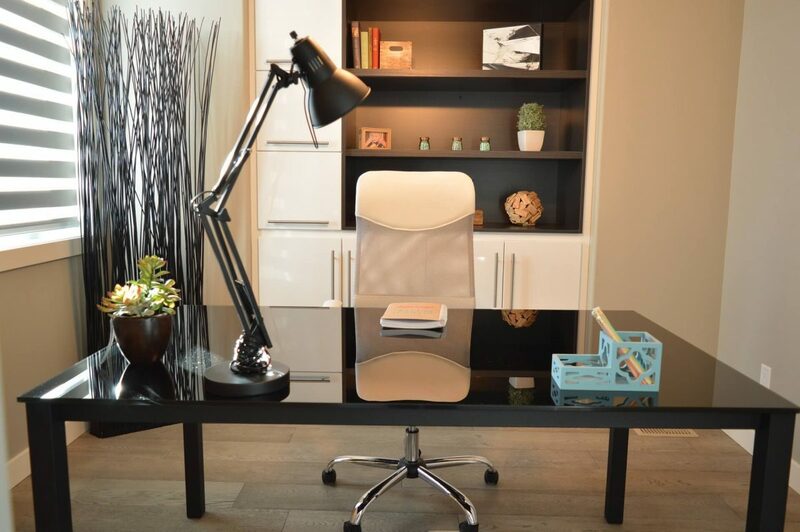 By strategically placing a few easy to care for houseplants in your custom home office you will be able to work smarter without working harder. If you don’t have the luxury of an extra room to dedicate to a custom home office consider improvising with a built-in desk. A built-in workspace in a common area like a living room or a bedroom can save space, and allow you to get your work done at the same time. If you want to create the illusion of a separate room within the parameters of limited floor space then consider using a large divider to section off your office. You can purchase or even build your own wall dividers out of wood or similar materials to help establish a separate workspace. It is very easy for a home office to become overwhelmed with paperwork and other clutter. Organize your space vertically and horizontally so that you can reach everything you need. Hang floating shelves or use vertical file folders. To keep your home office neat and organized you can hide unsightly, stress-inducing cords by storing computer equipment close to outlets. Your office space should be all about what motivates you. Put a framed photo on the desk or some reminders of a recent vacation. Decorate with whatever makes you happiest, and remember to always take a deep breath to let it all soak in. You shouldn’t have to do everything on your own. That’s where we come in. At Prestige Custom Building our priority is your happiness. We want to help you create the custom home office of your dreams. Your space should be one that helps you to be the most productive, and to meet all of your goals. To get started contact us today. We will work with you to design the custom home office you’ve always wanted at a fraction of the cost of our competitors. Sick of having to do everything yourself? Let us do the heavy lifting. You’ll be glad you did. Copyright 2018 Prestige Custom Building & Construction, Inc. All Rights Reserved.